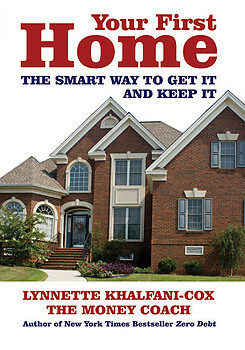 Your First Home The Smart Way to Get it and Keep it (304pp. ISBN 978-1-932450-85-9 7 X 10) was a book and cover design project commissioned to AMV Publishing Services in 2008 by Advantage World Press, Mountainside, NJ. The publication is authored by Lynnette Khalfani-Cox, personal finance expert, TV and radio personality, and the author of numerous other books including the New York Times bestseller, Zero Debt: The Ultimate Guide to Financial Freedom. Lynnette has appeared on such national TV programs as The Oprah Winfrey Show, Dr. Phil, The Tyra Banks Show, Good Morning America and various CNN programs on Personal finance and the economy. She has also been featured in top newspapers including the New York Times, Wall Street Journal, Washington Post, and USA Today, as well as magazines ranging from Essence and Redbook to Black Enterprise and Smart Money. Maybe you’re one of them. Too bad nobody ever taught you how to become a smart homebuyer – or even told you the whole truth about whether you were really ready to own a home at all. Until now. Home ownership isn’t a right. It’s a major responsibility. Your First Home offers a realistic look at the entire life cycle of being a homeowner – with all its joys and pains. Lynnette Khalfani-Cox, The Money Coach, is a personal finance expert, television and radio personality, and the author of numerous books, including the New York Times bestseller Zero Debt: The Ultimate Guide to Financial Freedom. Lynnette has appeared on such national TV programs as The Oprah Winfrey Show, Dr. Phil, The Tyra Banks Show and Good Morning America. She has also been featured in top newspapers including the New York Times, Wall Street Journal, Washington Post, and USA Today, as well as magazines ranging from Essence and Redbook to Black Enterprise and Smart Money. Lynnette is currently developing her own primetime TV series, called “For Love or Money,” which focuses on the financial issues facing couples. For more information about Lynnette, or to sign up for her free personal finance newsletter, visit her website at: http://www.TheMoneyCoach.net.